Indian Government has introduced new service it is called as Digital Locker. This service was launched by our Prime Minister Narendra Modi. Basically digital locker is an online secure locker, where you can store all your certificates in one safe place. You can keep all your certificates like Date of birth, Mark Sheets, Pan Card, Passport, Tax papers, Marriage certificate, Voter Id, Business Documents, Land properties, Shares ect. But there is a limited space in this locker. You can keep up to 1 GB size. 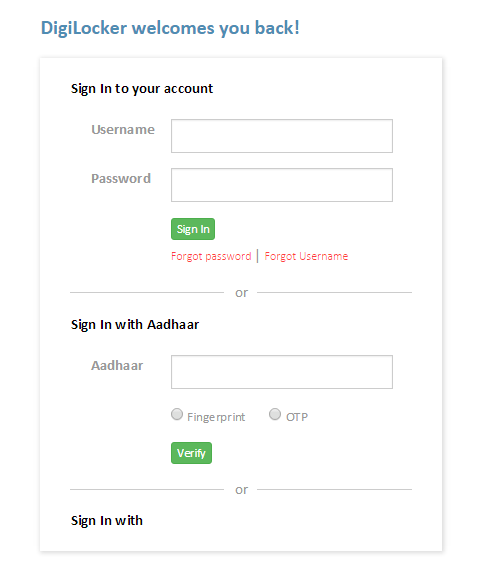 If you have an Aadhaar card then it’s a very easy to link your aadhaar card to digital locker. Here I will try to explain how to link Aadhaar card with digital locker. There are so many benefits you may get by linking your aadhaar card with digital locker. Suppose if you want to apply a pan card in this process you need to attach at least two identity proof of yours. If in case you have already kept your documents in digital locker, then you may send this link to them. Even this process is more secure. But before applying this process you should have Aadhaar card then only you may apply for digital locker online process. Just follow here step by step. Let’s start the process. Next you need to click on sigh in button. After that you may find two different sigh in process in that web page. If you have digital locker account then just enters the user name and password. Now you can upload your documents in digital locker. Even you can access whenever you wish to be. As you can see the above picture the digital locker web page look like that. If there will be any need of presenting your documents, now you can provide your e-documents link to the particular requester. Any one who is Indian citizen or any resident of Indian state or NRI or any foreign citizen with Indian internship. Here the list of Indian states, if you belong to any one of them then you are eligible for Digital Locker. This process is more secure and safe. Even there are so many benefits you may get by linking your aadhaar card to digital locker. I hope you have complete online process successfully. Even you can access whenever you want to be. There is no objections at all, without you no one cannot access in your account.